Karen Lee-Thorp has written or cowritten more than fifty books, workbooks, and Bible studies. Her books include A Compact Guide to the Christian Life, A Compact Guide to the Bible, and Why Beauty Matters. She was a senior editor at NavPress for many years and series editor for the LifeChange Bible study series. She is now a freelance writer living in Brea, California, with her husband, Greg Herr, and their daughters, Megan and Marissa. Karen Lee-Thorp ha sido autora o co-autora de mas de 50 libros, tanto de trabajo como de estudiosbiblicos. Fue editora en NavPress durante varios anos y hoy dia radica en Brea, California, con suesposo Greg Herr y sus hijas Megan y Maris. 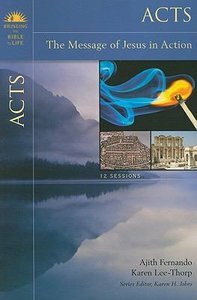 About "Acts (Bringing The Bible To Life Series)"
Karen H. Jobes is the Gerald F. Hawthorne Professor of New Testament Greek and Exegesis at Wheaton College. She is the author of many articles and several books, including The NIV Application Commentary: Esther.